Daniel Craig has revealed why the last James Bond film ‘Quantum of Solace’ was such a let-down - he was forced to write large chunks of it himself. The development of the film’s script was interrupted by the 2007/08 Writers Guild of America (WGA) strike, so Craig and director Marc Forster had to step in to finish it during shooting. Craig, who has been doing publicity for new film ‘The Girl with the Dragon Tattoo’, told Time Out: "On ‘Quantum’, we were f**ked. We had the bare bones of a script - then there was a writers' strike and there was nothing we could do." He said: "We couldn't employ a writer to finish it. There was me trying to rewrite scenes - and a writer I am not. Me and [director] Marc Forster were the ones allowed to do it. The rules were that you couldn't employ anyone as a writer, but the actor and director could work on scenes together. We were stuffed. We got away with it, but only just. Other projects noticeably affected by the writers’ strike included sci-fi sequel ‘Transformers: Revenge of the Fallen’ and TV show ‘Lost’. 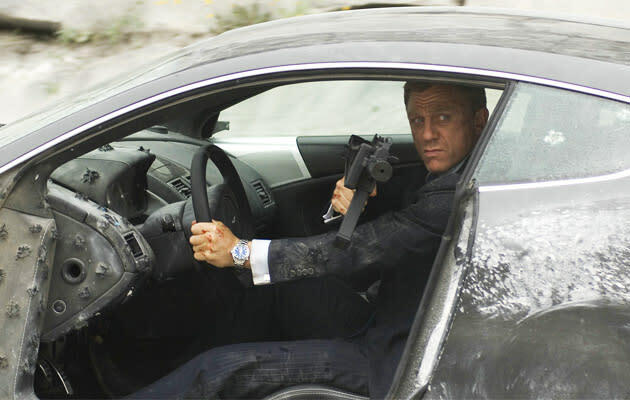 ‘Quantum of Solace’ got middling reviews from critics upon its release in 2009, and is now seen as one of the weaker entries in the 'James Bond' canon. Criticisms included a weak story, lack of dialogue and unmemorable villain whose plot to take over the world involved a plot to steal the water supply of… Bolivia. The latest 'Bond' movie, 'Skyfall', is out next year.